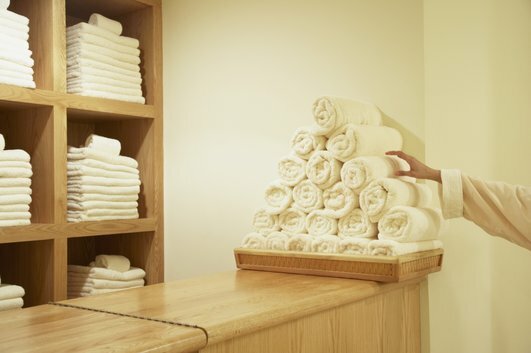 Patrons of spas and similar businesses, like gyms and fitness centers, expect clean, fresh towels. The solution: towel rental. Despite the recent recession, the United States spa industry has been on the rise since 2009. “Against a background of slow recovery in consumer spending the spa industry has kept pace with modest growth in revenues and visits,” said Colin McIlheney, Global Research Director at Pricewaterhouse Coopers. In 2013, the last year the data was available, the industry pulled in 14.7 billion in revenue and saw overall number of spa visits increase to 160 million, according to the International SPA Association (ISPA). “It is encouraging to see the total number of spa visits back at its pre-recession peak and even more encouraging to see total spa industry revenue reach a record high $14 billion,” said ISPA President Lynne McNees. According to researchers at Harvard University, increasing repeat visits by just 5% can boost profits by 25 to 125%. So it should come as no surprise that many spas – 83% according to the ISPA – have implemented a wide range of strategies to help stimulate revenue growth and encourage new and repeat visits. The strategies increased number of treatment offerings, new retail product offerings, additional spa programs, shorter treatment options, and towel rental programs. Patrons of spas and similar businesses, like gyms and fitness centers, expect clean, fresh towels. The solution: towel rental. There is no need to purchase towels, there is no need to purchase equipment, and there is no need to pay for any additional labor. Your towel rental service will handle everything for a flat, weekly fee. What could be easier? For over thirty years, Lord Baltimore has provided towel rental services to businesses throughout Washington DC, Delaware, Northern Virginia, Southern Pennsylvania, and Maryland. Our high level of customer service, coupled with our affordable prices has made us the go-to linen provider in the area. We offer our customers an alternative to the high volume corporate commercial laundries that are all too often big on volume but short on service. To learn more about how Towel Rental can help improve your fitness center, please contact Joe Bateman at Lord Baltimore by calling 800-292-1224. We also handle uniform rental, mat rental, and so much more. This entry was posted on Tuesday, June 9th, 2015	at 8:44 pm	. You can follow any responses to this entry through the RSS 2.0	feed. Both comments and pings are currently closed.